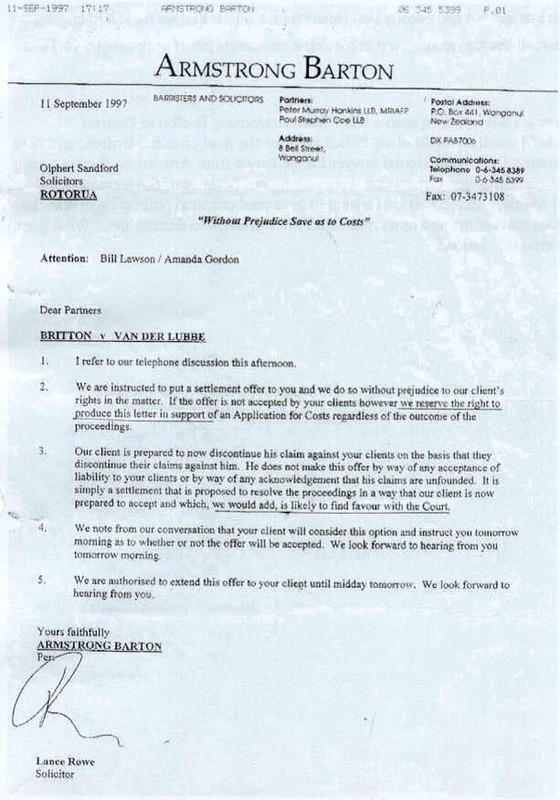 Britton had one last crack at us by hiring a lawyer named Lance Rowe of Armstrong Barton of Wanganui to bring an extortion bid against us in the Civil Court. They were trying to extort over $100,000 out of us for the ‘pine trees’ which Britton had, many times, admitted were not his and for the rest of his “gear” and his 20 (now 16) deer that he never bothered to pick up after he was given permission to do so. The below letter proves that their claims were bogus. They did not include the letter in their discovery documents. “We have no record of that letter” said Rowe when I asked him where the original was. I’d previously obtained a copy of it from the cops. Attempting to pervert the course of justice by withholding documents? We countered him by claiming damages for a number of his crimes against us. At the very last moment Britton “blew his arse” and instructed Rowe to fax us this letter. If that wasn’t an admission of guilt of all the crimes he had committed against us I don’t know what is. He gave up all his claims (that would have broken his avaricious heart) because he knew that his final bluff had been called and he that he would lose big time if he went to Court. I accepted his offer to discontinue because I couldn’t stand the thought of being in the same room with that evil nut and because we discovered, too late, that we had hired lawyers who were mainly interested in fee gouging and that doing a competent job of work came a very a distant second to that. Whanganui Crown prosecutor Lance Rowe has been appointed an acting District Court judge. Mr Rowe told the Chronicle yesterday the new position was “exciting and daunting”. There is a limit on how many permanent District Court Judges there can be at a time, so acting judges are appointed for judiciary cover. There is no limit to how many acting judges there can be. Mr Rowe will hold the position until March 2019, and hopes to move onto a permanent judge position. He has a jury warrant, meaning he can hold jury trials, among other things. Mr Rowe has been Crown solicitor in Whanganui at Armstrong Barton since 2008, and before that worked as a defence lawyer. He is also chairman of the Life to the Max Trust, a programme which engages with children and their families to prevent offending in the Whanganui community. Now his appointment has been announced, Mr Rowe cannot appear in court “effective immediately”, and will no longer be acting as a lawyer. “I’ve got mixed feelings obviously because I’ve really enjoyed being a prosecutor. Mr Rowe will be based in Palmerston North, because he has acted as a lawyer in Whanganui for too long to safely be a judge here. Sitting in Whanganui, he runs the risk of having connections with defendants or witnesses. He may return occasionally as a visiting judge, but would have to make sure he was not connected to key people in cases. Mr Rowe said he would miss the lawyers and police in Whanganui, as well as staff at Whanganui District Court, who he described as “absolute gems”. Despite his new title, Mr Rowe hopes people will still feel comfortable speaking to him normally outside court. “I threatened one person that if they called me ‘Your Honour’ outside the courtroom, I would hold them in contempt,” he said. Mr Rowe will be sworn in on June 9 in Whanganui.